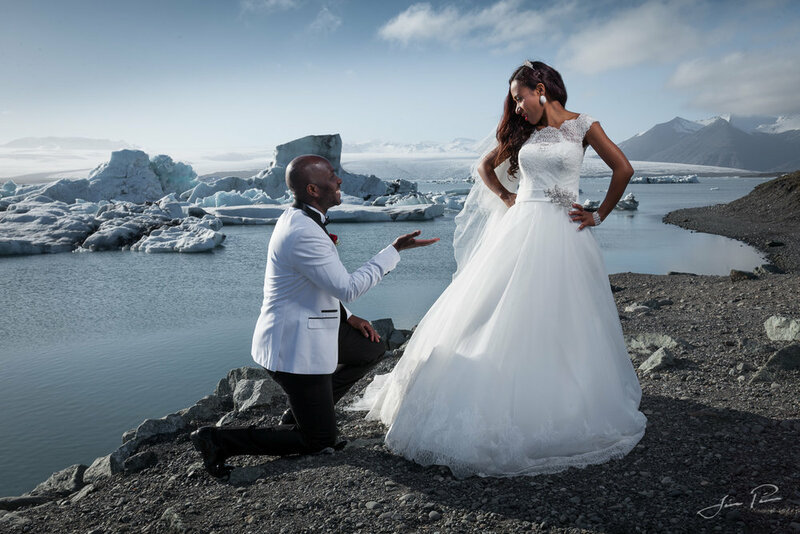 Pre-wedding photo shoot by the Glacier lagoon. Photo session in Iceland with Kusse Soka & Selamawit from Ethiopia. We started at the Glacier lagoonin the south east part of Iceland. We then went to the Diamond beach with glittering icebergs on black sandy beach. On the way back to Reykjavík we made a few more shots in Eldhraun, a field of lava coverd with green moss. Beautiful sunset at the end of a great day. They got married in Reykjavík later in the summer. Of cource we covered the wedding day. The good thing was that there was no pressure to get great shots on the wedding day since we already had such a succesful session. With such a lovely couple we got great shots that day nontheless.